This video, provided by B’tselem, an Israeli group that monitors the occupation, clearly shows a soldier executing a Palestinian in Hebron. He is killed with a shot to the head after he is already disabled and lying on the ground, posing no threat to anyone. 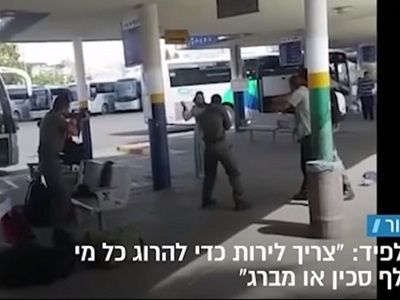 The Israeli army has called this a “severe incident” and is investigating. Let’s see how seriously they deal with the soldier. One can be sure he would face no action had this not been caught on film. What I find most significant about the clip is the routine way it is viewed by all those in the vicinity. 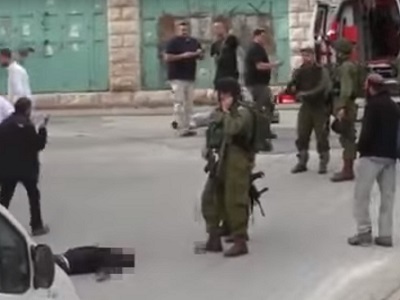 Two Israeli officers standing close by don’t bat an eyelid as the Palestinian man is murdered next to them. The soldier who executes the Palestinian even confers with another officer seconds before the deed, apparently getting permission. All of them seem to view this as standard operating procedure. And it is: in Israeli military parlance, it is called “confirming the kill”. – Jonathan Cook won the Martha Gellhorn Special Prize for Journalism. His latest books are “Israel and the Clash of Civilisations: Iraq, Iran and the Plan to Remake the Middle East” (Pluto Press) and “Disappearing Palestine: Israel’s Experiments in Human Despair” (Zed Books). Visit: http://www.jonathan-cook.net. THIS IS PUBLIC GENOCIDE OF PALESTINIANS and the world watches! Gaza epitomizes the epicenter of the harrowing ethos and pathos of human conscientiousness — the thesaurus to every psychological algorithm imaginable or inflictable upon a dispossessed people. For more than 60 years and several generations going forward, the people of Gaza — who were culturally and ancestrally uprooted from their homeland — have since steadfastly endured the abysmal scourge of survival and strangulated coexistence. of the most heinous nature. Uncondonable in perpetuity and a damning stigma on and of our presence in time’s athenaeum!